Bitter~Sweet ™: (Not so much) Wordless Wednesday - Look Familiar? (Not so much) Wordless Wednesday - Look Familiar? Let’s compare this . . .
to this . . .
and let’s take a closer look at that bottom corner. Ah, let’s take a peek at the inside cover! Last fall Spry Publishing contacted me about recreating my Diabetes Voodoo Doll for the cover of “Kids First, Diabetes Second”. Being commissioned to create cover art for a book is definitely something I never would have imagined I’d do. And although diabetes can be such a drag sometimes, this is something cool that never would have come along if I didn’t have diabetes. Thank you to Jeremy and Lynne at Spry for the wonderful opportunity and for the big reminder of my blog tagline, “life with diabetes isn’t all bad”. I had no idea that was your art! That is SO RAD! 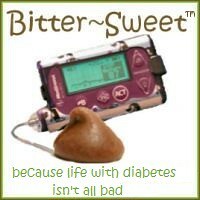 If you weren't diabetic I never would have met you, and THAT would be bad! Love you!!!! I noticed that it was your art, and just assumed you did these kinds of things ALL of the TIME. Well, congratulations! Thank you so much for agreeing to create the artwork for the cover. I am delighted that you, being one of my favorite PWDs, we're able to be part of the book project. You rule! That is so awesome, the art you've made! How awesome -and how true that the Big D can be so much a blessing in the friendships and opportunities to touch other lives. 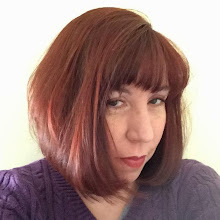 We are all better for knowing you and being touched by your awesomeness, Karen! (And I've resorted to using "awesome" in my comments three times...) Thanks so much for sharing all of this!! That is sooo cool! Who would have thought you would have "book cover artist" on your resume?! It was such a pleasure to work with you, Karen. The doll is the perfect piece of art for the cover, and what an added bonus it was to get to know you better because of it! Thanks again for agreeing to help us out. You really contributed something special to the book. This is so cool! I'm glad you included that inside-the-book page; it got me looking at it much more closely. Very, very cool, Karen. I'm really, really impressed! I love your nail polish. how awesome is that!!! now i can tell people that i "know" a book cover artist!!! congratulations!! This is so neat, Karen!! You are an artist...very clever! Diabetic children and their patents should identify very well with this. Karen, that's so awesome!! Congrats!! Thar She Blows . . . The Post I Don’t Know How to Write . . . .
Wordless Wednesday . . .